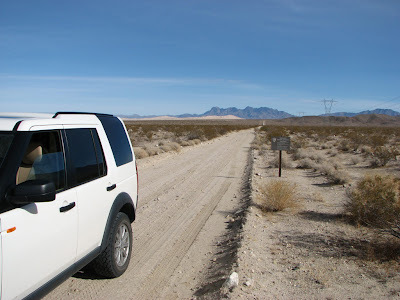 This past Friday, I drove the powerline road that runs between the Kelso Dunes Wilderness Area and the Bristol Mountains Wilderness Area. It was a fun drive. The road was in great condition and I only had to turn around once to avoid deep sand. To be fair, the wind had blown a sand dune across the road. Luckily, in that section, there was an alternate road that was in much better condition. Most of the road was smooth and recently graded. I was able to drive 35 mph or more while listening to CDs (without any skipping). 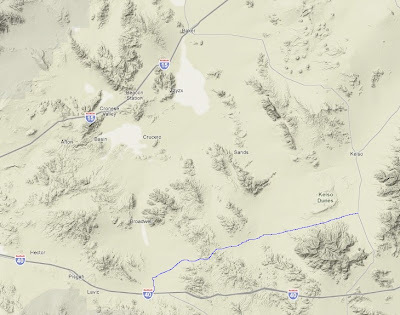 If you drive this road, then I recommend starting at Kelso Dunes and driving west toward Ludlow. That way, when you hit the sandy sections, you're going downhill and that's much less disconcerting. 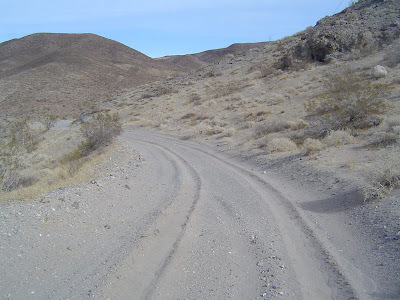 I can say this because I recently drove the sandy section the other direction - uphill - and that was a little disconcerting. The sandy section is on the western side of the Bristol Mountains. This google map is centered on that portion of the road. This shot was taken at the border to the Mojave National Preserve looking east toward the dunes. Here's a shot of one of the sandy sections. Notice how the tires had sunk in, and then the loose sand backfilled the tracks. The more gas I gave it, the slower I went.